Here’s an interesting problem I’ve had with NHL 12 – while playing the Be a GM mode, primarily I like to play as the NHL team. I’d say, probably a fair guess that most other people do too. But occasionally I do like to drop into an OHL team game for various reasons. Sometimes I want to see how well a prospect does, sometimes I just want to try and help out the team when playing a tough opponent. However, finding out who are tough opponents isn’t always as easy as you might think. Here’s why: I don’t have any idea who most of the teams in the OHL are, much less what their abbreviations are. 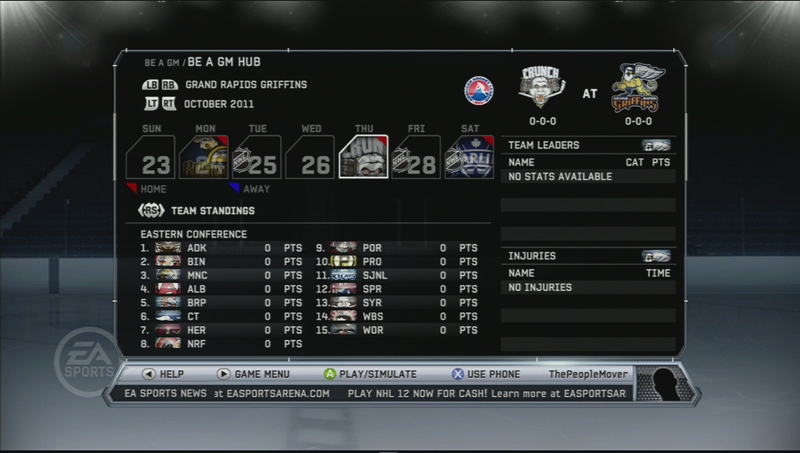 You’ll notice in the screenshot, I’m playing as the Grand Rapids Griffins. I can tell you the next game is against “the Crunch” only from their team’s logo. What city are they from? No idea. And what if I wanted to find out where they are in the standings? I’d have to know what their three-letter abbreviation is, and that’s impossible on this screen. The only way that you can figure it out is to try and match up the tiny slice of the team’s logo in the standings screen with the logo in the matchup in the upper-right. I can’t imagine that I’m the only person that hasn’t memorized all of the teams in the OHL. The bottom line is a fair amount of the time, I don’t know who I’m playing. Sometimes, that’s okay, but not always. The game is expecting users to know a piece of information when most users don’t. How to solve this? Just put the three-letter abbreviation in the matchup. So you’ll be able to find out where in the standings the team you’re playing is currently. Or, even better, put the team’s name somewhere so it will help me learn who the teams are. Either way, the user needs more timely information than what’s provided here. This entry was posted in Console, review, Sports and tagged abbreviations, game experience, grand rapids griffins, gui, hockey, jargon, nhl 12, sports games, ui, usability, usability in gaming, user experience, ux by mark d. Bookmark the permalink.